New sources of growth are urgently needed to help the world move to a stronger, more inclusive and sustainable growth path following the financial crisis. Innovation – which involves the creation and diffusion of new products, processes and methods – can be a critical part of the solution. While not a goal in itself, innovation provides the foundation for new businesses, new jobs and productivity growth and is thus an important driver of economic growth and development. Innovation can help address pressing social and global challenges, including demographic shifts, resource scarcity and the changing climate. Moreover, innovation can help address these challenges at the lowest cost. Innovative economies are more productive, more resilient, more adaptable to change and better able to support higher living standards. Governments play a key role in fostering a sound environment for innovation, in investing in the foundations for innovation, in helping overcome certain barriers to innovation, and in ensuring that innovation contributes to key goals of public policy. The OECD Innovation Strategy 2015 sets out a concrete agenda to strengthen innovation performance and put it to use for stronger, greener and more inclusive growth. Implementing an effective government strategy for innovation is particularly important as key trends – the spread of global value chains, the increasing importance and mainstreaming of knowledge- based capital (KBC), and rapid technological progress, including the rise of the digital economy – are leading to the emergence of a “next production revolution” (OECD, 2015a). In the current context of a weak global recovery, business and policy leaders need to take advantage of these trends to accelerate structural shifts towards a stronger and more sustainable economic future that creates new jobs and opportunities. Innovation underpins the growth and dynamism of all economies. In many OECD countries, firms now invest as much in the knowledge-based assets that drive innovation, such as software, databases, research and development (R&D), firm-specific skills and organisational capital, as they do in physical capital, such as machinery, equipment or buildings. Moreover, billions of people around the world, including in emerging economies, today have access to the Internet and are connected to one another, enabling knowledge diffusion and the creation of further innovations. The proliferation of massive amounts of data (such as geo-location data from mobile phones) is just a hint of what can be expected from the emergence of ubiquitous data generation and computing characterised as the “Internet of Things”. These, and other technological changes in fields like bio- and nano-technology and the associated advanced materials, will lead to ongoing transformations in the nature of production, jobs, the location of economic activity, and the respective roles of different sectors in the economy (OECD, 2015a). A contribution resulting from technological progress embodied in physical capital (Non ICT). 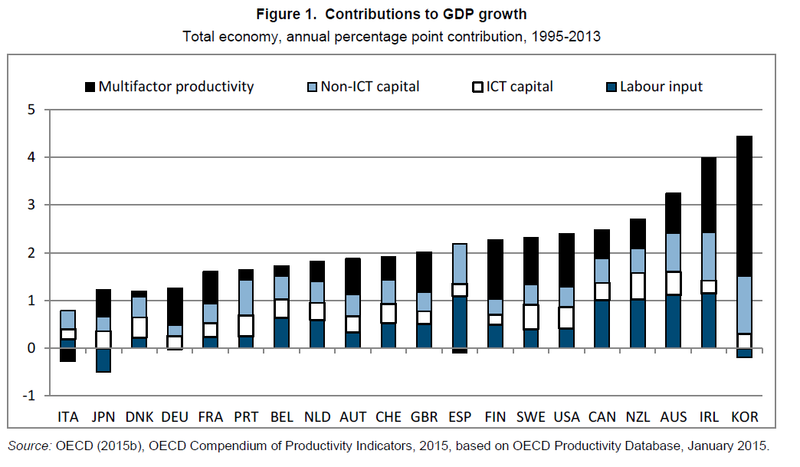 The latest OECD estimates show that about 0.35 percentage points of annual average GDP growth between 1995 and 2013 can be attributed to investment in information and communications technology (ICT) capital alone [Figure 1; OECD, 2015b]. A contribution resulting from investment in KBC, such as R&D, design and other intellectual property, data, firm-specific skills or organisational capital. A contribution linked to increased multi-factor productivity growth,(more output is obtained from the same set of inputs or equivalently that fewer inputs can be used to make the same amount of output.) Increased efficiency in the use of labour and capital, a substantial part of which can be attributed to innovation, including process and organisational innovations. A contribution resulting from the creative destruction that results from innovation, as new firms enter the market, sometimes growing quickly and thus increasing their market share, replacing other firms with low productivity. Together, these elements can account for a substantial share of economic growth – often around 50% of total GDP growth – depending on the country, the level of economic development and the phase of the economic cycle. Indeed, in the long run, it is difficult to imagine growth without innovation, as it would have to be based mostly on the accumulation of factor inputs, i.e. more labour (even if this might involve more qualified labour) or more of the same physical capital. The R&D GDP % trend lines compared to OECD total average. 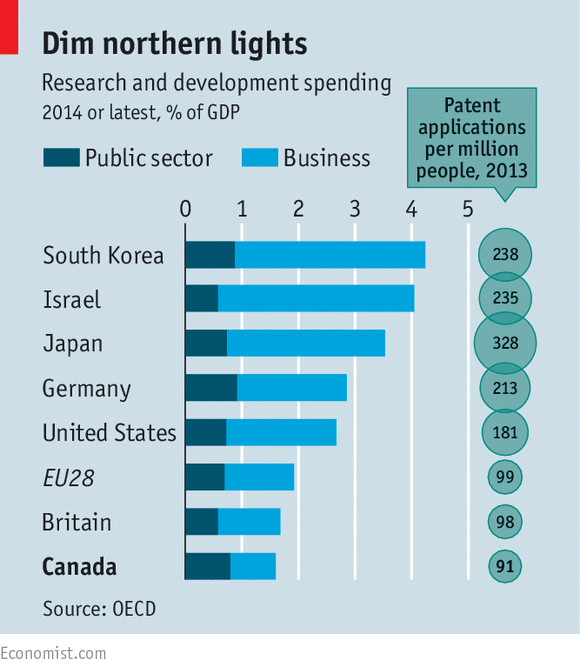 Canada lags in many aspects of innovation but most importantly in % R&D versus GDP. A report in 2013 on Canada’s innovation deficits by the Council of Canadian Academies, a think-tank, pointed out that the country’s managers have less education than executives in the United States and that government procurement policies do little to create markets for new technologies. Venture capital, the financial lifeblood of technology companies, is puny. Investment by Canadian venture-capital firms was C$2.6 billion ($1.9 billion) last year. That is 11% more than in 2014 but less than half as a share of GDP than in the United States. Canadian venture-capital funds also lack the expertise of their American counterparts, and so are less able to help companies grow. Stockmarket valuations for Canadian technology firms are lower than in the United States. As a result, most do not see a future for themselves as independent companies. Three out of four tech entrepreneurs surveyed by PwC, a consultancy, said they plan to sell their businesses within six years. The twin cities of Kitchener and Waterloo in Ontario embody both the strengths and weaknesses of Canadian innovation. The area’s most famous firm is BlackBerry, a maker of once-cool communications devices. Today it employs 3,000 people in the region, compared with 11,000 at its peak. When BlackBerry lost the smartphone war to Apple “everyone assumed that Waterloo was toast”, says Steve McCartney of Communitech, a non-profit group that helps tech companies. Yet the area seems to be thriving. Some 15,000 companies, at least a third of them startups, are based in the corridor that runs from Waterloo to Toronto. They employ 200,000 people. Mike Lazaridis, a co-founder of BlackBerry (and of the Perimeter Institute) is a University of Waterloo dropout. OpenText, one of Canada’s largest software companies, started as a university project to create an electronic database for the Oxford English Dictionary. Mr McCartney thinks Waterloo’s tech firms benefit from traditions of collaboration established by the area’s Mennonite groups. Communitech, which seeks to encourage partnerships between technology companies and the university, is a prime example. It hosts “VeloCity Garage”, where 120 startups work on such products as a self-driving floor scrubber and a device that helps doctors find veins. Kik, a messaging app with 275m users, started there. Yet Waterloo is more an exporter of talent than a magnet for it. The best business plans come from University of Waterloo students, says Paul Graham, co-founder of Y-Combinator, a venture-capital fund in California. A typical software engineer in Waterloo makes two-thirds the salary of his California equivalent (though the cost of living is also lower). Pay is “60-70% of the decision to move”, says Herman Law, a Waterloo graduate who works for a company that makes graphic-processing units for electronic games. Professional opportunities are also much greater in California. “The tech sector in Canada just isn’t as big,” Mr Law says. It ends up serving as the “farm team” for Silicon Valley, Canadians grumble. 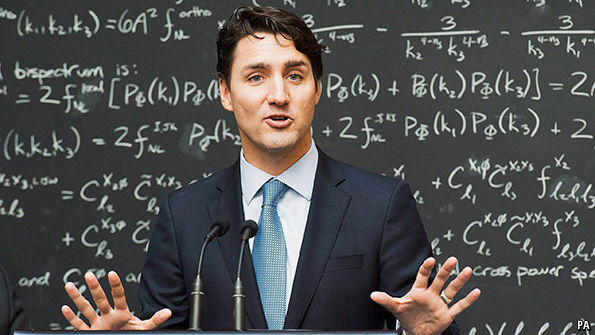 ASKED by a journalist in April about Canada’s role in fighting Islamic State, Justin Trudeau, the prime minister, came back with a pithy lecture on quantum computing. “The uncertainty around quantum states,” he explained, lets quantum computers encode much more information than the conventional binary sort can. This detour into geekdom seemed natural at the Perimeter Institute for Theoretical Physics, which Mr Trudeau was visiting to proclaim his enthusiasm for basic research. The video of the impromptu lecture went viral, adding to the glamour already radiated by the snowboarding, cannabis-legalising, refugee-embracing prime minister. The assembled physicists duly cheered; Mr Trudeau then answered the question. He has given boffins much to celebrate. Unlike his Conservative predecessor, Stephen Harper, who governed until last November, Mr Trudeau shows no inclination to muzzle politically inconvenient research. The Liberal government’s first budget, presented in March, increases federal spending on innovation clusters, university labs and research bodies, including the Perimeter Institute. In naming his cabinet Mr Trudeau rechristened the industry ministry: it is now the ministry of innovation, science and economic development. All this has more to do with economic necessity than prime ministerial nerdiness. For a decade much of Canada’s growth has come from natural resources, especially oil and gas. That allowed Canada to ignore its weaknesses as a producer of knowledge-intensive goods and services. In the World Economic Forum’s ranking of countries’ performance in innovation, Canada comes a dispiriting 22nd. As a share of GDP it has the lowest level of “technology exchange”—money spent on or earned from patents, designs and other forms of know-how—among the 15 countries tracked by the Conference Board of Canada, a think-tank. “The resource supercycle covered up a lot of issues around innovation and productivity,” says Dan Muzyka, the Conference Board’s chief. The end of the commodity boom caused a six-month recession last year; in 2016 growth is expected to be a feeble 1%. Without more innovation, Canada is unlikely to grow much faster than that for long. Canada does not lack scientists or good universities. Nor has its government been stingy. Public spending on research and development is higher as a share of GDP than in Europe and the United States (see chart). Where Canada falls short is in transforming ideas into marketable products. It produces relatively few patents. R&D spending by business has been declining for the past 15 years as a share of GDP; just 2.2% of companies are engaged in innovation, according to Dan Breznitz of the Innovation Policy Lab at the University of Toronto. Navdeep Bains, the innovation minister, says he knows what the problems are. His plan for solving them will be ready by early next year. It is likely to include measures to encourage more collaboration among business, government and academia. Some analysts think innovation incentives should depend less on tax credits, the main source of public support for R&D. Instead, the government should finance promising ventures. David Wolfe, of the Innovation Policy Lab, points out that Canada lacks a technology-development agency like the United States’ DARPA or Israel’s Office of the Chief Scientist. Insulated from political influence and pressure to produce quick results, such agencies can help commercialise technologies without spending much money, Mr. Wolfe argues. More self-confidence would also help, Mr. Bains thinks. “We don’t brag enough,” he says. After Mr. Trudeau’s elegant turn at the lecture podium that could begin to change. The federal Liberals recently announced their first budget in more than a decade, with innovation being a cornerstone of their economic platform. The budget promises to spend $800-million over four years to support innovation clusters and networks across the country, beginning with $150-million in the next fiscal year. The government held off from rushing out an innovation agenda, instead opting to give pause to ensure a thoughtful process before they put together a plan expected to be announced in the fall. These are encouraging signs that show this government is committed to developing a strong innovation policy. It shows the Liberals understand that this piece of public policy could shape Canada’s economy in profound ways over the next few decades. The rhetoric and intent may be right at this point, but there is a risk looming: In an effort to get it right, the government could become paralyzed, leaving programs and policies to calcify. A successful innovation agenda will be no easy task to develop, as it requires a fundamental reorientation of government, its risk-taking capacity and its willingness to take a good, hard look at legacy programs and make difficult decisions about what has been working well, needs tweaking or needs to be wholly upended. While the budget outlines resources to this innovation agenda, we need to be careful not to simply throw money at the problem and expect it to fix itself. For far too long, governments of all stripes have spent billions of tax dollars on infrastructure and science and technology funding under the guise of it being an innovation strategy. While there have been immense societal benefits from these investments, they have not successfully reoriented the Canadian economy for the realities of the 21st-century global economy. The development of this innovation strategy needs to focus on the commercialization of technology through all actors in the ecosystem, especially high-growth-potential private-sector partners, and needs to be clear about the outcomes it would like to achieve. This government will also need to recognize that there are inherent limitations in their ability to develop and execute this agenda. Unlike other pieces of public policy, the government must be comfortable with getting it wrong – and it must sensitize Canadians that getting it wrong is part of a necessary process. This policy needs the ability to evolve, to be nimble, to pivot when it hits a roadblock, to scale up parts that are working well and to write off parts that are not. These are all hallmarks of successful startup businesses, but they challenge the risk-adverse nature of Canada’s public sector. The biggest mistake we can make in developing this policy is to spend years trying to figure it all out, launching numerous consultations, a fierce political debate and then a full, comprehensive manifesto that claims to be the definitive road to success. It doesn’t work that way in the innovation economy. The technologically advanced world we live in today moves with great velocity and inordinate amounts of uncertainty. Our government needs to think differently about building an innovation policy – one that’s forward-thinking, that doesn’t rely on our past to predict our future, but most importantly that is capable of evolving with time. We need them to focus squarely on managing risk, not avoiding it. The nature of innovation requires our policy-makers to make a bold prediction about how our economy and society will develop in the longer-term. But predictions are difficult to make. Our best hope for developing a successful innovation policy is one that recognizes that we need a framework that is flexible and malleable, one that predicts what the future might look like but recognizes there will be parts of that prediction that are flat-out wrong and others that are pretty close, and then adapt accordingly. We can do this by testing policies and measuring outcomes before going full launch. The outputs of these tests will tell us which policies are working and which ones need to be tweaked. Some will have to be abandoned altogether, and that’s okay. But through this process of rigorous testing and data-driven decision-making, we will continuously learn about building a strong, made-in-Canada, globally competitive innovation policy. We’re living in unprecedented times, yet still live in a governance structure predicated on precedent as its primary means of governing. Our legislators are reacting. Our regulators are risk-averse. Our courts are developing judgments on precedent to decisions fundamentally different from today’s economic reality. And our collective society is unaware and unprepared. We’re building an economy on policies that do not at all reflect the present reality, let alone paving a way for what our future will look like. An incrementally successful innovation agenda does not come without perils. There will be collateral damage. We will have to deal with the moral and ethical implications of these advancements, challenges around the lack of distribution in society. The privacy implications of a digital economy will continue to percolate. If we let an innovation agenda reign free without thoughtful, broader policy apparatus adjusting for new economic realities, it has the potential to do harm to society. However, if approached with a progressive, forward-thinking outlook, we have the potential to benefit, both economically and socially. Canada has many of the ingredients necessary to become a global leader in the development and commercialization of some of the world’s most advanced technological innovations. But without a lean and agile public-policy framework to guide their growth and adoption, and by extension our national economy, we risk being left behind and slowly frittering away our quality of life.